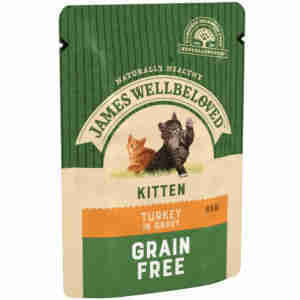 James Wellbeloved Kitten Turkey Pouch Complete dietetic wet feed for kittens. A wet food with the bonus that it is hypo-allergenic. With selected protein source (turkey) and selected carbohydrate sources (potato and cassava) it is a dietetic food, excellent for the reduction of ingredient and nutrient intolerances. We suggest that the food be tried for a period of 3 to 8 weeks. If the signs of the food intolerance disappear, continue feeding indefinitely. Turkey meat, pea protein, tomato pomace, cassava, potato flakes, sunflower oil, linseed oil, calcium carbonate, potassium chloride, chicory extract, xylose, cranberry extract, yucca extract. Tried the Turkey & Lamb varietys in this range and our kitten literally laps it up. The food looks very nutritious & appetising & from our kittens response must taste as good as it looks! Will deffinately be buying this again! initially fed this to my kittens but started mixing it with cheaper supermarket food to bring costs down. The result was that their fur went from super glossy to duller. I now solely feed this food again due to a good deal I got on here and find that the fur has gone back to wonderfully glossy. Even my neighbour noticed and commented on their glossy fur yesterday. I would think that glossy fur is based on healthier body overall. They also seem sated for longer on this food. Not going back to supermkt stuff!